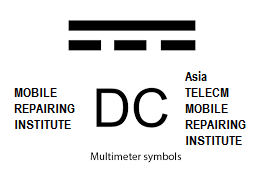 Multimeters are of two types – Analog Multimeter and Digital Multimeter. The only difference is that a digital Multimeter has a digital display of all the readings. 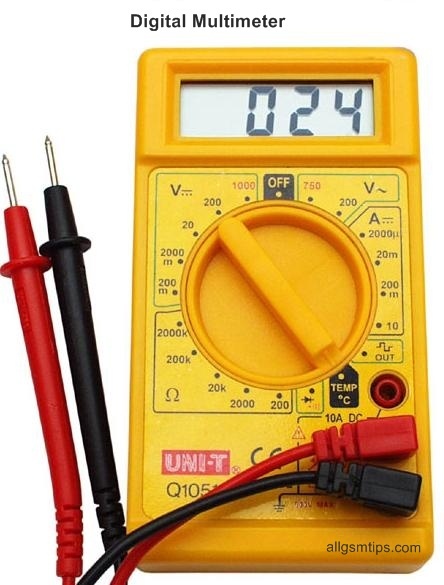 An analog Multimeter has a needle-type pointer that moves to a reading while testing any device or electronic component. Two probe RED & BLACK, Red probe is positive and Black is Negative. When Buy New Multimeter , Insert Red Probe in VΩmA Slot & Black Probe in COM Slot. 10A & 20A not in use in Mobile Repairing. DC Voltage Range – This range is use for measure DC current While Mobile repairing always set on 20V DC. AC Voltage Range – This range is use for measure AC current. BUZZER & DIODE RANGE – This range is use for measure continuity testing. Function and Range Switch: This switch is used to select the function and desired range as well as to turn the instrument. In order to extend the life of the battery of the Multimeter, this switch must be kept in the “OFF” position when the instrument is not in use. Display or LCD: To display all the readings. Common Jack: Plug in connector for black (negative) test lead or probe. V ? mA Jack: Plug in connector for red (positive) test lead or probe for all voltage, resistance and current (except 10A) measurements. 10A Jack: Plug in connector for red (positive) test lead or probe for 10A measurement. Connect the red probe to “VΩmA Jack” and the black probe to “COM” jack. Set the “Range Switch” to desired Ohms (?) position. If the resistor to be measured is connected to a circuit then TURN OFF POWER and discharge all capacitors before measurement. Connect probes to circuit being measured. Read resistance value on display. Connect the red Test Lead to “V ? mA Jack” and the black lead to“COM” jack. Set the “Range Switch” to diode position. Connect Red Test Leads to Anode of the Diode and Black Test Lead to Cathode. The forward voltage drop in mV will be displayed in the screen or display. If the diode is reversed, figure “1” will be displayed. Set or red and black test leads or probes. Set the “Range Switch” to desired AC V position. Connect Test Leads to device, electronic component or circuit being measured. 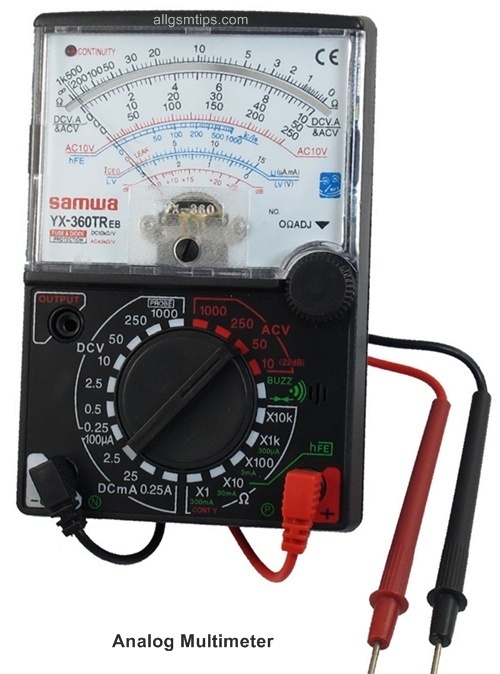 Voltage value will appear on the Digital or Analog Display the Multimeter. Set the “Range Switch” to hFEposition.leads into the proper holes of the hFE Socket on the Front Panel of the Multimeter. The Multimeter will display the approximate hFE value at the condition of base current 10 µA and VCD 2.8V. Connect the red Test Lead to “V ? mA Jack” and the black lead to “COM” jack. Set the “Range Switch” to Buzzer. Connect test leads to the two points to be tested. If the resistance is lower than 100 Ohm then there will be buzzer sound which means that continuity is OK.
Set the “Range Switch” to Signal Symbol. A test signal appears between “V ? mA Jack” and “COM” jacks. The output voltage is approx 5V p–p with 50 k ohm impedance. Connect the k-type thermoelectric couple to “V ? mA Jack” and “COM” jacks. Set the “Range Switch” to “Temperature Position”. The display will read the temperature value in Celsius or Fahrenheit. 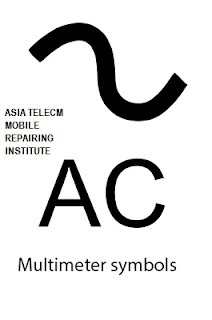 Most Multimeters can easily measure room temperature from 0 to 35 degree Celsius. Just set the “Range Switch” to RT Position and the present room temperature will be displayed. To avoid electrical shock, hazard or damage, do not measure voltage exceeding 1000V or 750V above earth ground. Different Multimeters may have different measurement range. Read the instruction manual carefully before operating the Multimeter. Before using the Multimeter, inspect Test Leads, Connectors and Probes for cracks, breaks or crazes in the insulation. Before attempting to open the case of the Multimeter, be sure to disconnect test leads or probes from any energized electronic circuit to avoid electrical shock. Replacing Fuse: Fuse of a Multimeter rarely blow or need replacement. If it happens, it is because of operator error or mistake. If required just replace the old fuse with a new one with proper polarity. Battery Replacement: If the symbol of battery appears on the display, it indicates that the battery has to be replaced.